If you’d like to find antiques, let’s go to Teramachi street in Kyoto! Teramachi street is quite small street beside Kyoto city hall. It’s famous for many antique shops and galleries. On the way back from Ippodo tea shop, I’ve found interesting souvenir shops here. We can meet new artistic designs in addition to traditional things on Teramachi Street! Once I couldn’t find what kind of shopit was, but actually, it was a shop specialized in small boxes of woodprints. Opening them, there are bean snacks, tea of buck wheats etc. The woodprints are created in the local area in Kyoto, Hanase. Entering a shop, there were many pretty boxes were displayed. I have heard designs changes according to the seasons. Now, we have beautiful winter sceneries in Kyoto or monkeys, which is the zodiac of the next year 2016. Petit envelopes of monkeys were also sold to welcome New Year. We have the costom to adults in family and relatives give money to children in the New Year in Japan. First, we will choose the inside of the box from Japanese candies, sweet beans, or tea etc. Next, choose the designs of the box, and go to a cash register. It’s so cute that we hesitate over which to choose! 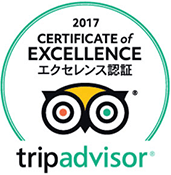 It will give delight for sure as a souvenir of Kyoto. Main store is near Keihan Kawabata Marutamachi station, called “Kyoto Hanga kan”. But I remembered I might have seen these designs somewhere in Kyoto. Asking the staff, these boxes are sold in Gion and Isetan department store in Kyoto station also. 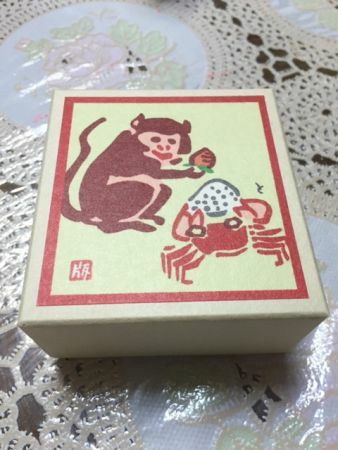 Today, I bought a box of “The battle between crab and ape”, which is Japanese folklore. I remember my mother had read me when I was a small child. It is good to bring back home because the snacks last long. 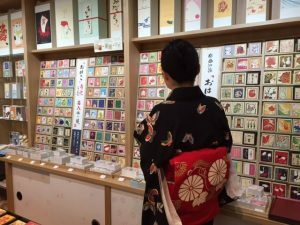 I think these pretty boxes painted five stories pagoda, Kinkakuji temple, Maiko and Japanese flowers will remember your stay in Kyoto for sure. Next to Ohakoya, I found another interesting shop. 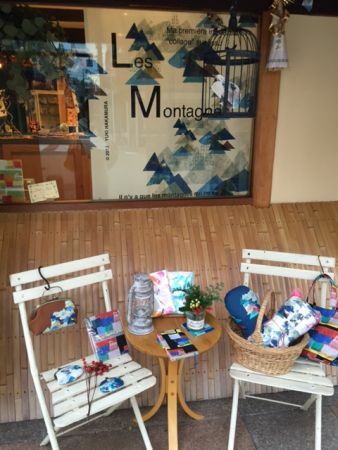 This textile design called Les Montagne is the image of Kamo river, main stream in Kyoto. Many things such as cushion, handkerchiefs, and Japanese purses are made of Les Montagne textile. I thought it’s the image of France even in Kyoto. It’s only one nice design in the world!